It is generally accepted by end-users that there are no compressed air applications that could not benefit greatly by the installation of one, or more air receiver tanks. It is also generally accepted that the decision to install a vertical or horizontal receiver tank usually depends on the physical space available. 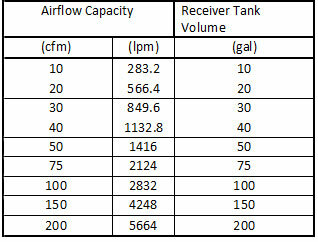 Generally, an air receiver should be sized according to the volume and pressure variations in air consumption (demand) and the compressor size and the control system strategy (i.e. modulation or on-off control). It is possible to calculate the maximum consumption in the system by summarizing the demand of each consumer. The summarized consumption must be multiplied with a utilization factor for each consuming item. To better understand the meaning of the term “utilization factor”, please see the following example: if you have an air tool (the consumer), like an impact wrench, which is rated by the manufacturer for a consumption of 25 CFM at 100 PSIG, this wrench may be turned on for only 20 seconds at a time to tighten an individual nut to its required torque value. Initially, the tool will consume the full rated 25 CFM as it tightens the nut against almost no resistance but as the torque rises on the nut, the tool will consume less air until the final torque is achieved. The tool will then have an interval where it is not turned on again until the tool is used again on the next nut and so on. Because the tool air consumption under load is not uniform throughout the process of torquing the nut, and the interval between applying the tool between individual nuts varies, the difference in CFM load plus time interval becomes the utilization factor. In other words, just because the tool is rated at 25 cubic feet per minute (CFM), this does not mean that the tool requires the full rated CFM for each full minute nor the full minute to complete the job. 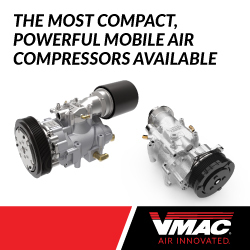 On the other side of this example it is important to remember that air receivers are also used to meet heavy, short time demands of certain equipment, volumes that exceed the supply capabilities of the installed compressor. 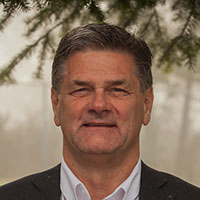 The minimum receiver capacity for certain applications may be calculated, but experience and judgment are important at this point. It is common that an end-user will use a standard sized receiver for specific compressor models based on their supplier’s recommendations. For calculating a receiver size, it is necessary to have a pressure band (differential) for the receiver to be effective. If the consumption process requires 100 psig and the compressor is set to deliver 100 psig, there is no storage and no buffer. Any increase in demand will result in a tank pressure drop below 100 psig until the compressor responds by increasing the air volume compressed to refill the tank and restore the 100 psig. If the compressors is set to deliver 110 psig, the difference between 110 psig and 100 psig accounts for the air stored in the receiver. 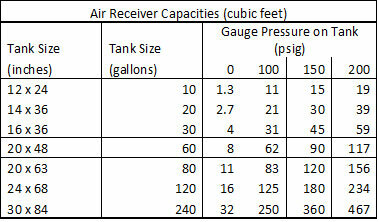 If the 100 psig demand increases, the tank pressure can drop 10 psig before the minimum set pressure requirement is met. Pressure and flow controllers can be used after the receiver for stabilizing downstream pressure to 100 psig and flattening demand peaks. 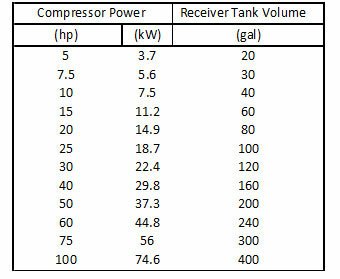 Note: In any compressed air system, the discharge piping and /or hoses also form part of the storage volume. 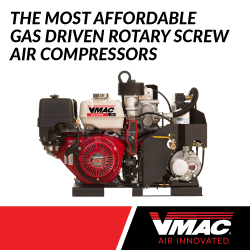 It is also common to size receivers to 1 gallon for each ACFM (Actual Cubic Feet per Minute), or 4 gallons per compressor HP (horse power).